I strongly recommend you take a quick look at my early 2016 Stats post - click on ‘SC - 2016 Sales Stats’ in the Labels column to the left. Stats Post #2 is especially important to read regarding a Bloomberg article that appeared March 3, 2016 and was reprinted the next day in the Vancouver Sun. The piece is about retired Vancouver lawyer Jonathan Baker who sold out in Vancouver and moved to the Sunshine Coast - “pocketing millions” in the process. You want to keep the date of that article in the forefront of your mind as you look at these ‘$1mill plus’ single detached home sales and all other 2016 stats I will post in the days ahead. The tables on the left above show 2016 month-to-month sales and offer year-over-year comparisons. 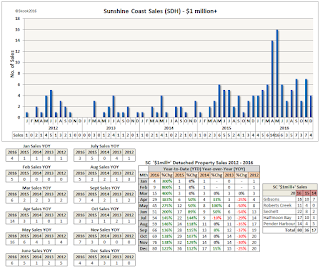 The middle table reports monthly ‘Year-to-Date’ sales with ‘Year-Over-Year’ comparisons. For example, June shows 51 year-to-date sales (Jan-June) and they were 200% above 2015 YTD sales and 2015 YTD sales (17) were 89% above 2014 sales and so on. 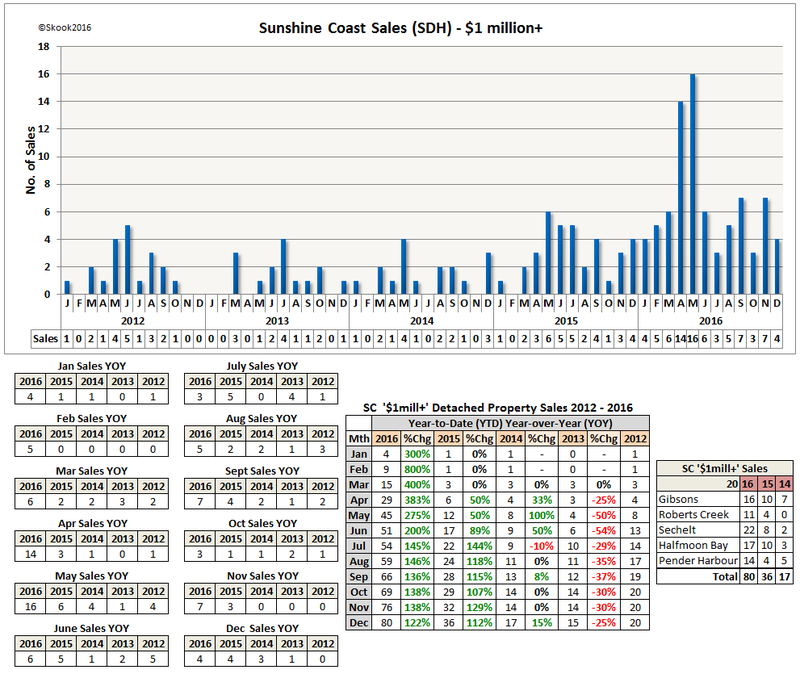 The small table on the right shows total ‘$1mill+’ SDH sales for 2016, 2015, and 2014 for the 5 market areas on the Sunshine Coast. 2016 sales rose a dramatic 122% over 2015, 408% versus 2014, and 433% over 2013. Crazy. I don’t know what detached sales over a million dollars were like a decade ago in the last boom. The SC set a new record for lot sales in 2016, so I wouldn’t be surprised if the 80 high end property sales here were also a new record. Did you note the peak months? Yes, April and May - immediately after the release of the Bloomberg article on March 3, 2016 and its reprint in next day (March 4) in the Vancouver Sun. It is interesting to note the Van Sun’s headline to the article: ‘Millionaire boomers decamp Vancouver pocketing housing windfalls as city becomes a ‘commodity’. Well, I think as I post the 2017 stats, we’ll see the same modus operandi on the Sunshine Coast. At last, the SC has reached Vancouver Burbhood - something I anticipated while looking across the Skookumchuck Narrows one day back in 2005. All that’s needed now is the Fixed Link (land bridge) to complete the process and the unique character of the SC will be gone forever. It was inevitable, but sad nevertheless.